Without the currently available plethora of X-ray methods, basic research in the physical sciences would be unthinkable. The methods are used in solid state physics, in the analysis of biological structures, and even art historians have X-rays to thank for many new insights. Now, scientists at the Helmholtz Center Berlin (HZB) have identified yet another area of application. The team around Dr. Martin Beye and Prof. Alexander Föhlisch was able to show that solids lend themselves to X-ray analysis based on nonlinear physical effects. Until now, this could only be done using laser analysis. The work is being published in the e-pub-ahead-of-print-issue of the journal Nature. Their results could potentially redefine what future lightsources ought to look like. Nonlinear effects form the basis of laser physics. Until now, they did not appear to be useful in X-ray analysis. The physics that underlie X-ray methods were based solely on linear effects, meaning whenever the radiation encounters the object that is being examined, each light particle – each photon – is working in isolation. With lasers, it's a different story. The energy and power density of incoming laser light can get so high that photons actually work together and nonlinear effects result from their interaction with matter. This results in materials greatly enhancing certain colors of light. 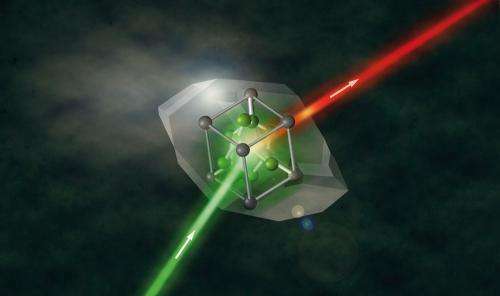 In other words, if you irradiate a crystal with green light, the light that gets irradiated is actually red. This color can be precisely correlated with the structural properties of the material that is being analyzed. Now, Alexander Föhlisch from the HZB and his team were able to observe through a series of experiments at Hamburg's short-pulse X-ray laser FLASH that these types of effects can also be achieved using soft X-rays and that this method works on solids as well. "Normally, inelastic scattering processes using soft X-rays are ineffective," explains Martin Beye, the study's primary author: "Our experiment allowed us to document how inelastic X-ray scattering can be intelligently intensified. Just like a laser, the different photons are actually working together and amplifying each other and we end up with a very high measurement signal." Looking ahead, by setting up appropriate instruments, synchrotron sources might hold a strong appeal for research fields like superconductivity experiments, which previously relied almost exclusively on neutron scattering. Inelastic scattering processes are also in demand when we're talking about element specific investigations. Like, for instance, if the goal is to distinguish between ions of the same element according to their oxidation state, which, in turn, isn't possible using neutron scattering. Further examples are time-resolved processes, ultrafast processes like the breaking and formation of chemical bonds. "Modern-day X-ray sources are not at all optimized for the application of inelastic scattering," says Alexander Föhlisch. "With the current results, we know that we can use nonlinear effects even with soft X-ray radiation. What we need are photon sources capable of delivering short light pulses in rapid succession. This has to be taken into consideration during future photon source development." With its BESSY-VSR upgrade project, the HZB is creating just the right prerequisites.